The cogeneration AH series is used in enterprises, schools, swimming pools and hotels. The annual heat demand is designed from about 150 thousand kWh and power requirements for 40 thousand kwh. AH series electricity capacity adjusted for 5 to 20 kw. According to the actual needs, we can choose the right type. meanwhile, the machine will adjust the heat volume according to the customer actual needs, means that high efficiency and short payback periods. The AH series equipment has an operator terminal to monitor all supervisory and control functional interfaces .Cogeneration can be easily integrated with existing heating systems, with higher power requirements, and more equipment can be used to provide higher output.Cogeneration has made valuable contributions both in terms of economy and climate and environmental protection: greatly reducing energy consumption, reducing CO2 emissions, providing effective exhaust gas purification and reducing NOx emissions with a controllable three way catalytic converter. CHP unit can supply heat and electricity by gas, through the booster heater, the gas achieved the ideal temperature, then come into the engine fired and come to work. Engine machinery can be converted into electrical energy through the motor and then merged into the city network. 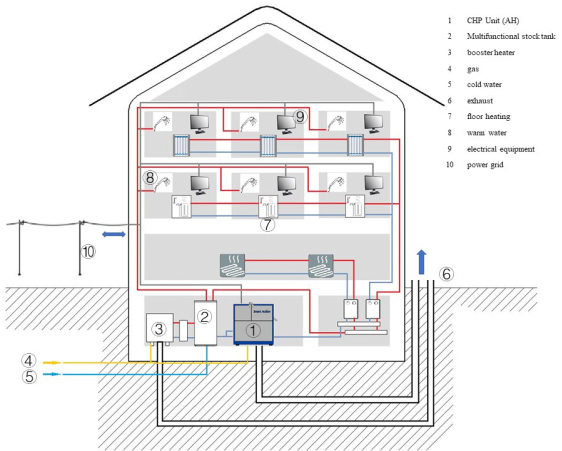 The waste heat part is stored in the multifunctional storage tank through the heat exchanger, and the heat is provided by the heating pipe or radiator in the room, and hot water can also be provided for the user. The CHP unit is based on the use of heat to determine the power generation, and the power generation is first used for all kinds of electrical appliances, and the remainder is entered into the city network.